The first thing to note about the GTX 970 launch in general is that it is a highly competitive one. While most GTX 780 and R9 290X cards still retails for at least £330 or so (and some for much more), it isn't hard to find example of both SKUs retailing for closer to £275. With a starting price of £260, Nvidia is coming in at a highly aggressive price point with this launch. Sticking to the same 28nm process has probably been beneficial here, as the maturation of the process will mean higher yields, which is a key enabler of lower pricing. The vast majority of GTX 970 SKUs are priced below £300, yet they offer performance that is as at least as good as AMD's typically more expensive flagship card (and often better for factory overclocked models), and do so with significantly lower levels of power consumption and heat output. Meanwhile, the GTX 980 is left comfortably at the top of the product stack without any real competition from AMD, allowing Nvidia to price it less aggressively. There are always those who will buy the latest and greatest no matter what, but for the rest of us, the GTX 980's pricing makes the GTX 970 look an even better deal. Even on paper, this is clear. The only real difference between them is a slight clock speed decrease and a 19 percent reduction of CUDA cores, texture units and geometry units via the disabling of three SMMs, yet the MSRP of the GTX 970 is a whole 39 percent lower than that of the GTX 980. Not only this, but as we've seen here, factory and user overclocking can bring GTX 970 cards into within a fraction of the performance of the flagship (at the cost of some extra heat and power) or even allow them to surpass it in the very best cases. 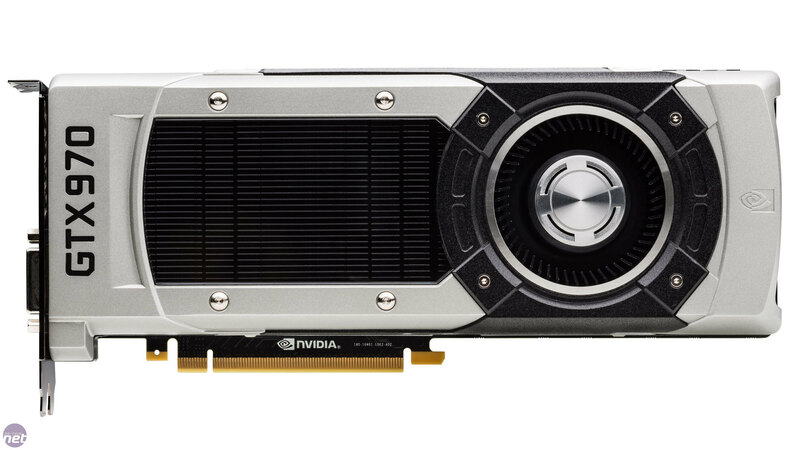 For the value conscious high-end shopper, the GTX 970 is the card to get. As such, the question then becomes one of which specific SKU to buy, as Nvidia's AIC partners are out in full force with various offerings, each no doubt promising to be better than the last. 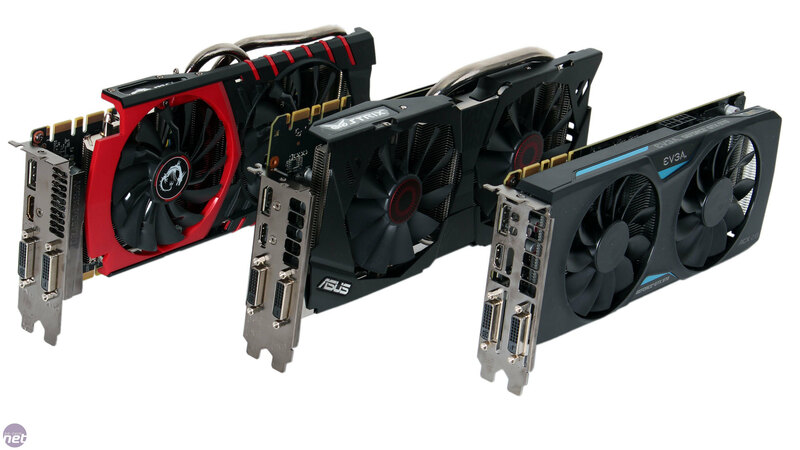 Even within this three card round-up, there's a lot of data to take on board, so we've summarised a lot of the key differences between the ASUS, MSI and EVGA cards in the table below. *Users who buy this card may receive one from the first production batch with no backplate. EU users can register online to receive a free backplate if this is so. None of these cards are bad. By virtue of using the GTX 970 GPU and all coming in at less than £300, they're fast, quiet, efficient and well-priced. Any of them would make a welcome addition to a high end system. Were these standalone reviews, all three would receive recommendations for these reasons alone, and this is reflected in the scores and awards below. With that said, there are of course differences to consider. For those of you interested in small form factors, the EVGA GTX 970 SC ACX2 is a good option, as the height of the card does not extend past the edge of the PCI bracket, which can be an issue in certain mini-ITX cases. More generally speaking, it's also the fastest card out of the box, so if you're not interested in overclocking yourself then that's good reason to go for it. However, we dislike the small but apparent noise emitted from the power circuitry under load. It won't affect everyone – only those with otherwise quiet systems or with their PC right next to them, but it does put us off. Next is the ASUS Strix GTX 970. Its upgraded power circuitry and single 8-pin power connection makes it the most efficient card here. Its cooler is big, but it's also whisper quiet and has the ability to turn its fans off altogether, even when running light games, and there's no hint of power noise either. Its the slowest card here out of the box, and it doesn't seem to boost as well as the other two cards, instead prioritising quiet operation, but there's room for solid overclocks. In fact, once overclocked, EVGA's clock speed advantage all but vanished. It has a metal cooler shroud and backplate as well. You'll pay a premium for it, but it does have the makings of a premium card. That brings us to the MSI GTX 970 Gaming 4G, and of the three it's this one that stands out as the best. At £282, it's the cheapest on test and only £20 more than reference pricing. Despite this, its solid boosting credentials means it matches the EVGA for speed in most tests. The slightly lower than dual slot height of the cooler also makes it a good choice for those looking to run two GTX 970 cards in SLI. Furthermore, it has the beefiest power delivery system of all three cards, and with this we managed to overclock it to a level that actually surpassed the GTX 980 at stock speeds. Your mileage may vary, of course, but this is undeniably a fantastic result. Add in the super quiet operation and semi-passive cooling mode, and you've got yourself a truly awesome graphics card.